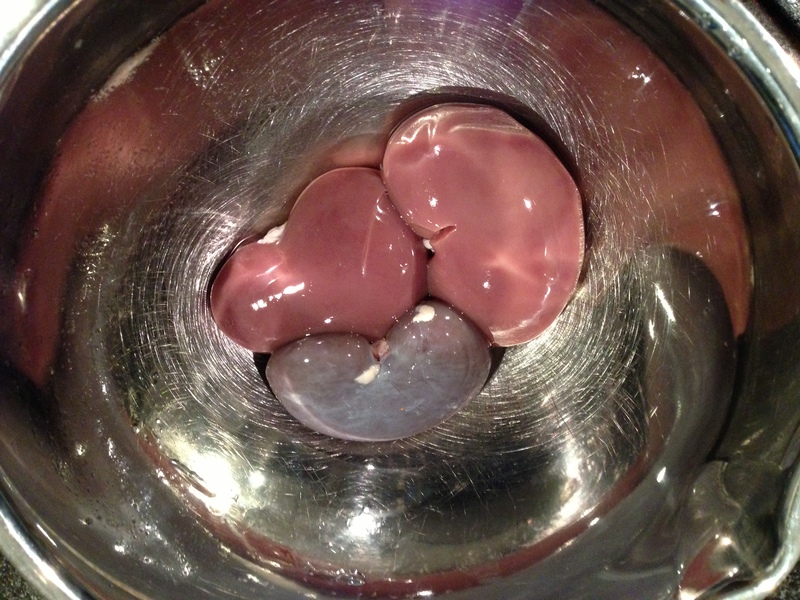 Goat and lamb kidneys (I think the smaller grey one is lamb) from Apple Creek Farm in Bowdoinham. Surprisingly delicious if first soaked in salt water and then alcohol, to remove much of that urine-y essence. The taste-buds of toddlers, even the most omnivorous of ones, seem to grow pickier near the age of two. That’s certainly been the case with Theo. We depend upon green smoothies, fortified with kale and carrots, to get vegetables into him now. He tends to favor plain starches, bananas and peanut butter, granola and other sweet items these days. So we were delighted to discover he had a taste for lamb kidneys and liver, and tripe soup, at a recent special Greek diner menu at our beloved Trattoria Athena here in Brunswick. 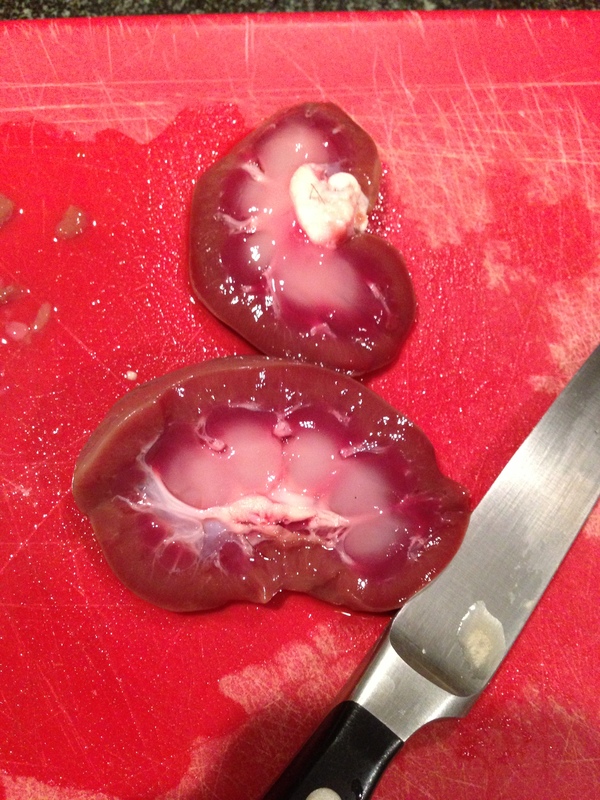 I was also happy to discover I had a taste for kidneys, after my unpleasant experience with rabbit ones a while back. 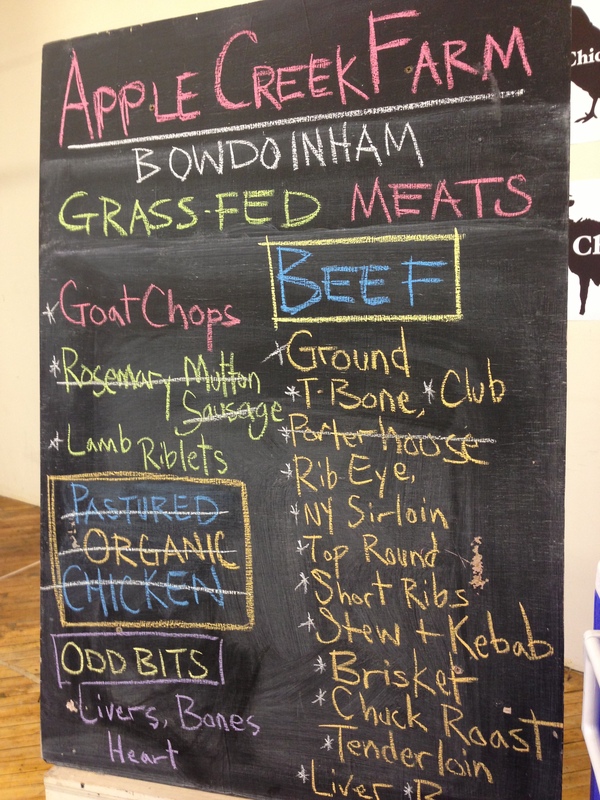 And pleased to discover Apple Creek Farm in Bowdoinham sold delicate lamb and goat kidneys at my Brunswick farmers’ market for an affordable $3 a pound. Apple Creek farmers Jake and Abby said the only other customers who ask for them are mothers inspired by Sally Fallon’s Nourishing Traditions. “Odd bits” such as kidneys are a great farmers’ market find for those on a tight budget. I’ve bought lamb and goat kidneys twice from them now and found them delicious. I think the goat ones had a more off-putting barnyard aroma, but by eating time, I got confused which was which. To remove the kidneys’ urine flavor (hey, urine is sterile anyway:)), I soaked them in heavily salted water and then some beer the first time and sweet vermouth the second time I made them. For a recipe, I adapted Mark Bittman’s one for breaded veal kidneys sauteed with shallots and sherry, from his How to Cook Everything. I drained the kidneys and discarded their liquid, removed tough white membranes, sliced them into tender medallions, salted and peppered them, then dredged in flour and pan-fried in butter. I kept them warm in a 200 degree oven while I sauteed shallots with more butter in the pan, and then deglazed it with sherry and sweet vermouth and a touch a maple syrup for sweetness. That sauce goes over the kidneys. Serve warm with crusty bread. A kidney cross-section. I realize not for the faint of heart. Unfortunately, now-finicky Theo refused the kidneys both times at home. Mama sure enjoyed them as an appetizer, but their richness, like liver but with a sweeter, less metallic flavor, meant I couldn’t make a meal of them. 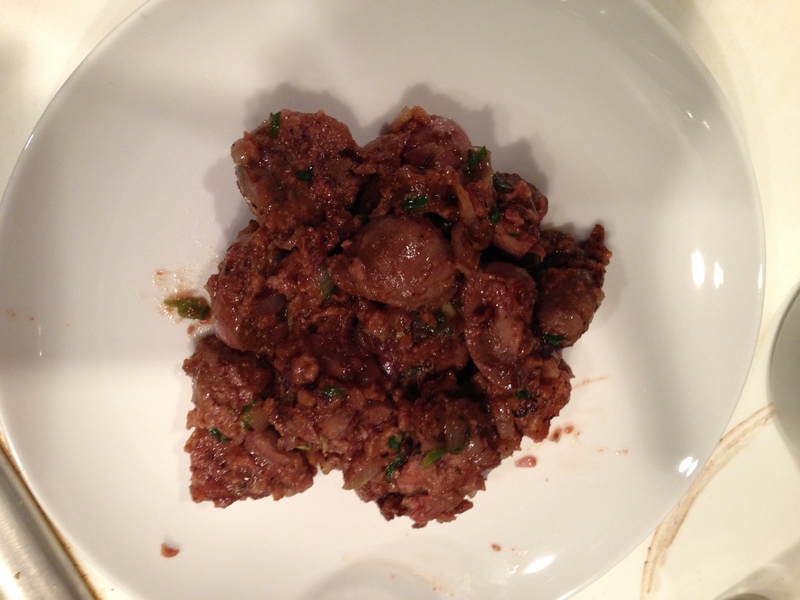 A little goes a long way with offal. Let’s hope this kid becomes omnivorous again when he turns two in June. What happened to my keen sardine eater? The pan-fried kidneys. They could be a pricey app at a trendy Portland restaurant. All yours for $3 a pound.